Like most folks, we have drawers full of flashlights that we’ve accumulated over the years. Some work and some don’t. Most commonly the non-functioning ones have broken bulbs, which was the major shortcoming of all flashlights prior to the advent of the LED (light emitting diode). It is hard to argue against the brightness of halogen or xenon bulbs in modern flashlights, except that the bulbs commonly fracture if you drop the flashlight. If you are on a hunting trip and moving around in the dark, it is easy to trip and fall, and the last thing you need to have happen is for your flashlight to malfunction. That is the most significant benefit of LED lights. You can drop them, submerge the good ones in water, sit on them and they still work. 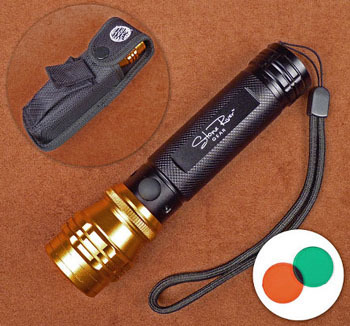 The Stone River Gear flashlights are among the best on the market and if you take into consideration their price, they are likely the best for the buck. The high performance SRG3TAFS produces a discrete beam reaching beyond forty feet. There are significant differences in the LED's used in flashlights. The cheap LED lights sold in big box stores and at flea markets may have 9-11 LED's, yet their candlepower is measured in micro candelas. They average about 90,000 micro candelas (1,000,000 micro candelas =1 lumen) and their beams become diffuse and useless after a short distance. Whereas, the CREE LED's in the SRG flashlights produce illumination that is measured in lumens. There is a sliding adjustable focus function that adjusts the beam from wide (flood) to a pinpoint beam (spot). The SRG3TAFS features three functions/output settings, producing 150 lumens on its 3-Watt setting, 80 lumens on its 1-Watt power-saving setting and 150 lumens on its strobe mode. If you are venturing into the woods at night, you want to see where you are going, what is up ahead and on occasion where you came from. Additionally, the head and barrel of SRG lights are machined from aircraft aluminum, rather than the thin-walled aluminum tubing found in knock-offs. Neither of these problems exists with the Stone River Gear LED flashlights. They produce more lumens than either the Surefire or Mini Maglight and use standard AAA alkaline batteries. In addition, the guides loved the strobe function of the SRG, which made it easier for them to locate each other at night. By the second night, every one of the five professional guides and our outfitter were using the SRG lights to come off the mountain. Suffice it to say, when we asked them if they wanted to return the lights after the nine-day hunt was over, they declined and offered to pay us for the lights. We refused the money and James Economos of Stone River agreed to let them keep the lights. Since that hunt, the outfitter has ordered several dozen lights to give to his future clients. Copyright 2012 by Jim Clary and/or chuckhawks.com. All rights reserved.